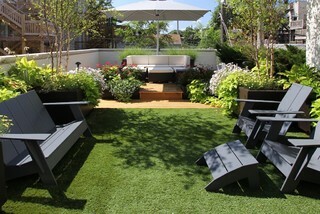 Small Yard of the Day! The Institute for Computational Design ICD and the Institute of Building Structures and Structural Design ITKE of the University of Stuttgart designed and built a robotically woven carbon fiber pavilion whose structure was inspired by beetles. Continuing the tradition of building a new pavilion each year, ICD and ITKE’s design explores the limits of biomimetic design, lightweight shells, and robotic fabrication. via ICD ITKE Research Pavilion 2014 « Inhabitat – Sustainable Design Innovation, Eco Architecture, Green Building. Featuring stunning sea views and a secluded garden with large natural rock formations, Samujana Holiday Villa 11A is an exotic retreat in Ko Samui, Thailand. The residence is a treat in itself, but also offers a privileged hillside position for contemplating the neighboring sights. Located just minutes from Samui International Airport and the stunning beaches of Choeng Mon and popular Chaweng, this is a holiday escape at its best. via Exotic Holiday Villa in Thailand Built Around Natural Rock Formations. via Modern Architecture Meets Indian Design on Houston’s Lakeshore. via barensfeld architecure ramps hilgard garden terrrace in california.